To truly put the “custom” feel in custom wrought iron doors, you will benefit from considering the accessories that add very little to an iron door’s price but add a lot to an iron door’s look. What can you do to accessorize a secure, beautiful, majestic iron door? Plenty! 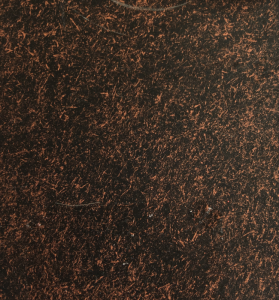 Our custom iron doors can be finished in any of 10 custom patinas. We do not want to hide the iron foundation of our doors, so these are all metal-inspired paint options. 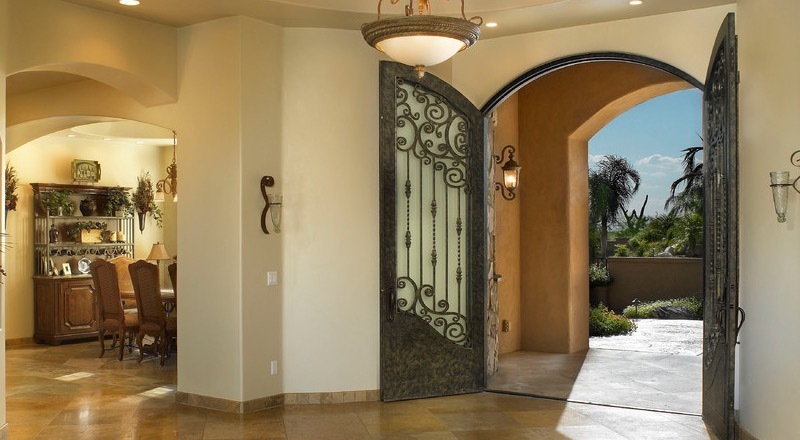 They will provide a formal, dignified tone to your Arizona home’s entrance. The finishes that seal in these colors are tough enough to withstand years of careful cleaning without worry that the paint will fade. Arizona weather is a phenomenon most people outside the state do not appreciate. The beauty balances with the unpredictability, so the glass inserts used in your custom iron doors are ready for any weather challenge. Each glass design gives a different look to your iron door. For maximum privacy while still enjoying plenty of light, steer toward Pear or Rainbow. Or consider the two reflective finishes. Your glass insert can be fixed or hinged for opening to allow ventilation. Let in the breeze or enjoy privacy as you choose. An advantage of the hinged-glass insert is the ease of cleaning both sides, especially if you opt for the metal screen insert to prevent unwelcome insect entry. 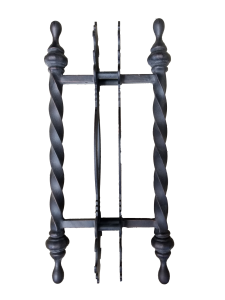 While we offer four custom pull handles ranging from geometric to organic, we can also forge completely customized handles for your beautiful iron doors. And do not worry about the ability of the handles to take the strain – they are made of the same high-strength, robust iron used in the doors themselves. Do not overlook the metal screen insert to prevent insects from entering your Arizona home. Remember, too, we are custom iron door fabricators, so if you have something tickling your imagination, share it with us. We can customize our doors to please you. For further information or to share your ideas, please contact us today.